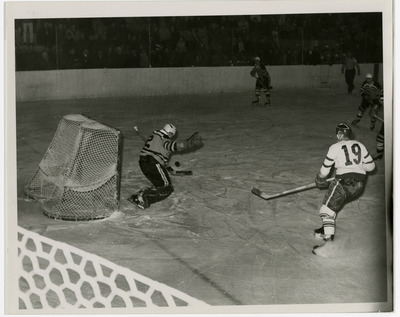 "Granger Evans Shoots on Goal"
Photograph of a 1964 UND Hockey game. UND player F. Granger Evans (19) shoots on net. Evans played both wing and defense for UND from 1961 until 1964. He scored 9 goals and tallied 10 assists during his career, which included the 1963 NCAA Hockey Championship.